‘Times were hard in 1880s. Beef, mutton and dairy produce all alike were difficult to dispose of at anything like remunerative prices. 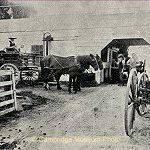 But there came to farm near Hamilton a Mr [David] Gemmell from California and he started making butter as carried out in the United States on a somewhat improved system from that of the ordinary farmer. One day he invited Mr Henry Reynolds to take a pound of his butter and keep it in his cupboard for two months and at the end of that time he said it would be found “perfectly sweet and good”. Mr Reynolds did so. The boast was proved correct. ‘Henry Reynolds was up betimes on November 3, 1886. After an early meal and with the blessing of his wife who, valiant pioneer that she was, helped him so much in those days, he hastened from his home to the simple little factory erected a mile or so away. There he busied himself in preparation for the arrival of his neighbouring farmers with their morning’s milk. For this was the day when butter, and ‘Anchor’ butter at that, was to be made for the first time in New Zealand on the factory system. ‘With typical Cornish thoroughness – he and his brother Richard were Cornish farmers of moderate means who [twenty] years previously had taken up several blocks of land in the Waikato district – he had already had a trial run on the separator the previous evening with milk sledged from his father’s farm by a lad named Hicks. ‘So the great adventure started. The butter turned out in the small factory gave satisfaction to all who handled or ate it. Mr Gemmell operated the factory for the first season and was succeeded in September 1887 by Mr Archie McVicar. Mr McVicar made that butter.